The Traveler's Century Club (TCC) is the oldest travel club with the aim of systematic travel, i.e., to travel everywhere. Most top travelers on mosttraveledpeople.com (MTP) & nomadmania.com (NM) are also members of TCC. 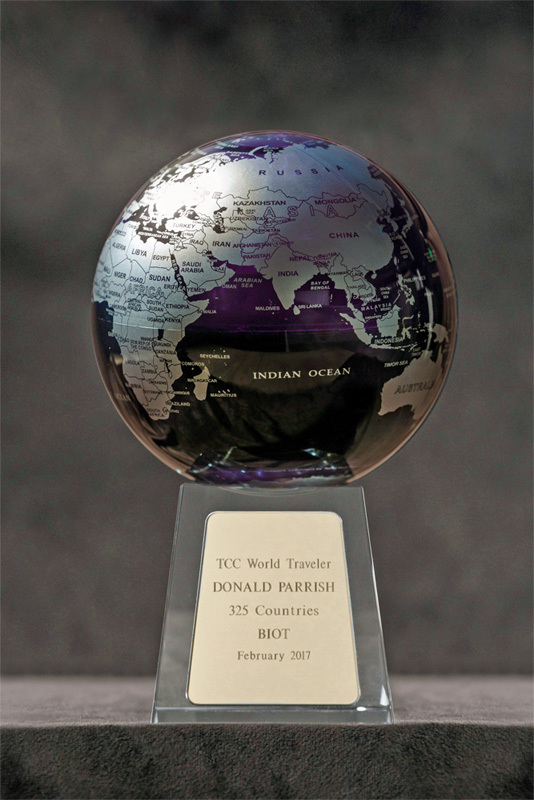 The TCC President presented me this award for completing the TCC travel list of 325 countries on March 11, 2017. It consists of an engraved plaque on a pedestal of European crystal and a high-tech globe that rotates by solar power. January 1, 2018, the TCC Board added the British Bases on Cyprus and British islands of South Georgia & the South Sandwich Islands. I visited them in 2010 and 2014. Thus I had completed the 327 TCC list before it was announced. The Globe, powered by sunlight, rotates silently, slowly and magically. Receiving the TCC Award was the culmination of a half century of travel. This page provides a broad brush overview to explain my life time travel journey that led to the TCC meeting in Laguna Beach, California on March 11, 2017. There are various lists for travelers who aspire to visit everywhere on our planet. The main one that travelers individually gravitate to is the list of UN Member States. It is straightforward. It is not a matter of opinion. There is no club to join. There are 193 UN members. How many people have accomplished the feat of visiting all 193? Harry Mitsidis, who has done the most research on this topic, created this UN Master's list. It is organized into categories allowing a reader to determine the answer depending on their criteria. Given the easiest criteria the number would be almost 171, tiny compared to, for example, the 4,000 climbers who have reach the summit of Mount Everest. Various people have created a "UN +" list by adding countries to 193 UN member states to give a more complete list of countries. On February 10, 2017, I became the first person to complete the NM UN+ list of 267 countries. For most serious systematic travelers, after completing visits to the 193 member states, the Travelers' Century Club list would be the next widely recognized benchmark to accomplish. So how many have completed the TCC list? The answer is 23. Go to the TCC website to read the Club History. Compare 23 who have completed the TCC list since it was created in 1954 to the one day record of 40 who reached the top of Mount Everest on May 10, 1993 or the 24 men who have orbited the moon. During my first overseas trip in 1965, I spent the summer working as an unskilled laborer in Germany speaking only German. This also included a visit to France on my motorcycle with a German youth group. Visiting my pen pal in East Germany was the highlight. We started corresponding in 1960 and are still in touch. In 1967, I made driving trips to Canada and Mexico. In 1969, I visited Russia & Eastern Europe. In 1971, I made a 6 week trip around the world. In 1973, I visited the Caribbean & South America. In 1974, my travels took me to Fiji, Australia & New Zealand. In 1976, I made my first trip to Africa. In 1977, I worked on my family tree in Scandinavia. Returning from that trip, I became the planning manager for AT&T Bell Labs telephone switches being sold for the first time outside of the United States. I visited a few new countries for work every year and continued my usual vacations to see new countries. My work experience provided me an in depth look at some countries because of repeated visits. In addition to my International travels, I made driving trips all over the United States. By 1981, I had completed visits to all 50 U.S. States, my first major travel objective. My second travel objective, was making visits to all UN member countries, but I did not yet have that as an explicit objective. I was working at it every year. Here is a page showing my Journey to visit all 193 UN countries. In September 2000, an executive at work dropped by my office with a clipping of an article in the Chicago Tribute. His comment was: "You are the only person I know who would be qualified to join this Club". I had never heard of the Travelers' Century Club. But I was intrigued. I got a copy of the TCC countries and verified that I qualified with over 100 countries on their list. So I sent in my check for $35.00 and joined in November 2000. In early 2001, I realized the tremendous value of TCC membership when it sponsored a trip to Cuba, virtually impossible for the average traveler to visit. TCC organized a legal, 11 day visit in April. I could not believe my luck to get to Cuba. See my trip report. Unfortunately, this was just before I bought my first digital camera. The trip to Cuba was eye-opening. It was my first time to be around truly top travelers. Although in my circle of friends, I was the most traveled person, but in this group of 11 travelers I was the least. So I listened and learned. The first surprise: I was asked, "What number is Cuba for you?" or something like that. I was confused. It was explained to me. When I got home, I counted. Cuba was my 114th country I had visited out of the 313 countries on the TCC list. Later I would learn that the TCC list would slowly grow in number. Now it is 325. In a discussion of their travels, I heard the word "Bouvet" for the first time. Where was "Bouvet"? I listened to the discussion wondering if I should ask and reveal my ignorance or pay attention and figure it out? I was shocked to learn how much it cost to visit Bouvet Island, and how many times people had failed to make a landing. No landing meant the place could not be counted. I never had the idea that I would fail to visit a place. My education was beginning. On the Cuba trip, I meet the beloved Herbert Goebels, who was our tour guide. Later I would take another 10 trips with Herb. I also met Klaus Billep, who headed TCC at the time. Klaus planned a few dozen trips for me over the years. 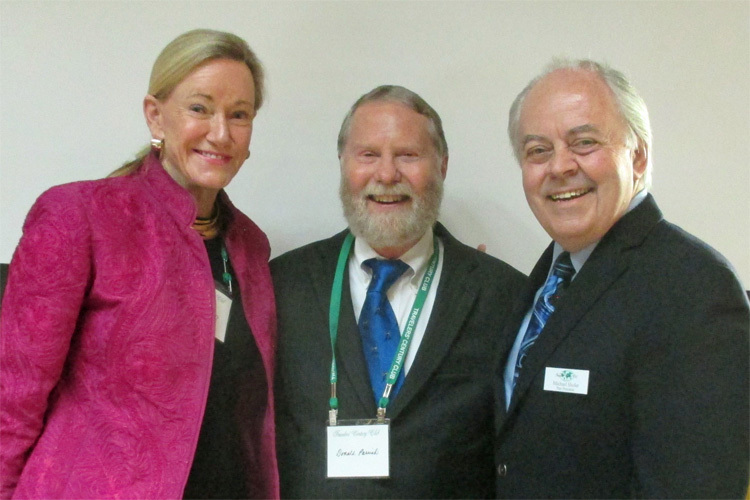 Two of the travelers on the Cuba trip, Ray Woods and Audrey Walsworth, went on to complete the TCC list. After returning from Cuba, I began two years of study at the College of DuPage for Spanish and Web Design. I learned enough to create my personal website. An early accomplishment was a master travel page to plan and to track my UN and TCC travels. It was extended and adapted over the years. This page has a map and a Wikipedia link for each TCC country, which includes all of the UN member countries. In the world before Google maps, this was an invaluable planning tool. I encouraged the head of TCC at the time, Klaus Billep, to improve the TCC website. He requested that I allow my work on maps and the other information links to be copied on the TCC website. I was happy to agree, and was proud to have an acknowledgement on the TCC website. I continued to travel with TCC to the hard to get places like Libya in 2004 after it opened to US travelers after being closed for 28 years; North Korea in 2005, virtually impossible to visit at that time; Iraq in 2006 this was during the war; and Afghanistan in 2006 and other countries in Middle East. I was traveling independently and with other groups like the Circumnavigators to some special places like Star City in Russia in 2003. TCC was the club that introduced me to the world of systematic travel. And my transition to MTP in 2005 was a natural outgrowth of working on the TCC list. I was recruited to TBT in 2012 and served on its first Executive Committee. Over time, I became more serious about visiting Unesco World Heritage Sites, and created a page to plan & track my visits. See my WHS planning page. It is my gift to fellow travelers. BIOT was the name of my 325th TCC country. It is the abbreviation of British Indian Overseas Territory. On February 10, 2017 we landed on Île du Coin, one of the islands of Peros Banhos, one of the authorized island groups on our permit. This island was interesting because of the ruins from when it was a coconut plantation. 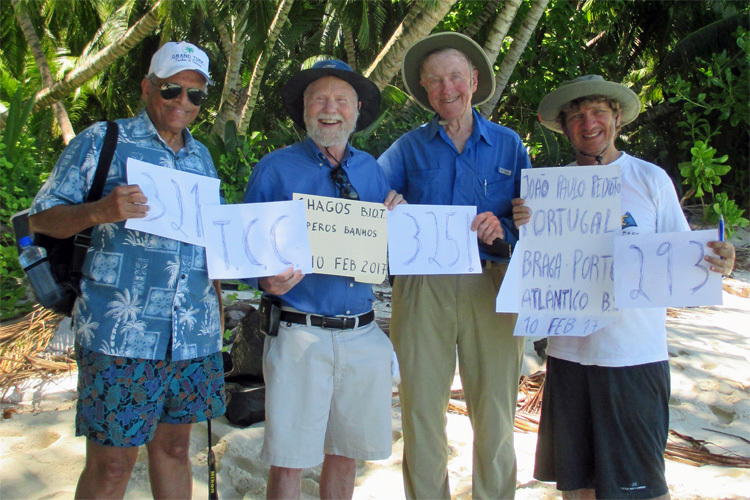 Here I am with friends and fellow TCC members: Jagannathan Srinivasaraghavan (321), Bob Bonifas (325) and João Paulo Peixoto (293). Look at those big smiles! It took me 4 attempts to visit BIOT. This is the hardest TCC destination per the TCC history. In 2011, I met Dr. Srinivasaraghavan, who was my tent mate, on a trip to the South Pole on its 100th anniversary. In 2006, I met Bob on a TCC trip, guided by Herbert Goebels, to Iraq, Afghanistan and Central Asia. In 2009, I met João Paulo on a TCC trip, guided by Herbert Goebels to West Africa. They are holding their BIOT numbers in the photo. Bob Bonifas has also completed the TCC list. The TCC was founded in Southern California. On March 11, the TCC's quarterly meeting with 55 in attendance was held in the Mozambique restaurant in Laguna Beach. It was nice to meet some old friends I had traveled with and some new travelers. President Gloria McCoy and Board Member Michael Sholer presented me the award for completing visits to all 325 countries. I made a few comments on how I joined the TCC. I had worn my Rockhopper penguin tie from Tristan da Cunha, but in my excitement, I failed to mention it. Completing the TCC list is a very special travel achievement! The joy of travel is always the unexpected. After the luncheon I asked Pam Barrus, a TCC Board Member, if Richard Halliburton's old home was in the area? 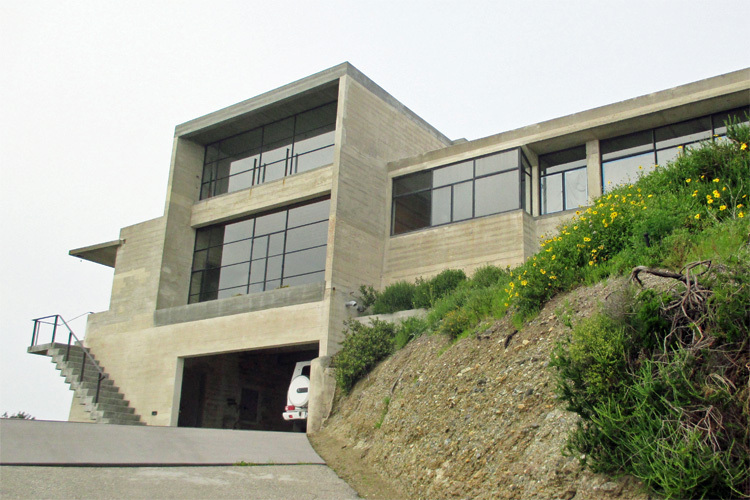 It is called the Hangover House, and it was constructed in 1938. Pam and I are both big fans of Richard Halliburton and Pam had sent me emails about the sale of this house. (Video showing its abandonment and views.) Pam sprung into action. As Pam navigated from memory, Kevin Hughes, TCC Secretary, drove JoAnn Schwartz, TCC VP, and I on a tricky route to the house just 3 miles or so from the Mozambique restaurant. Pam and I are big fans of Richard Halliburton (Video explaining Halliburton.) because his book, The Complete Book of Marvels fired our imagination for travel. I received a copy on my 11th birthday. (Informative Video Tribute.) 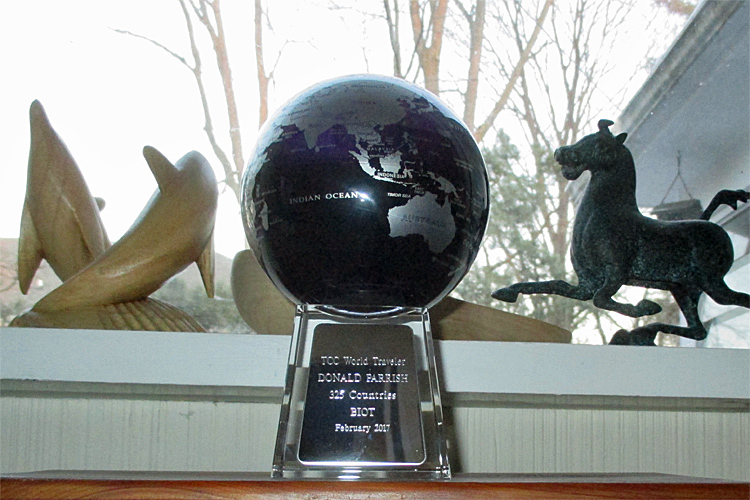 Without that book, the probability is high that I would not have received the "Globe award" from the TCC. So seeing a glimpse of his house with my friends, Pam, Kevin and JoAnn was an absolutely perfect ending to a memorable afternoon. Part of the pleasure of travel is to take advantage of your opportunities. The RMS Queen Mary, converted into a hotel, has been docked in Long Beach, California (See drone video.) for 50 years. In 2003, I crossed the Atlantic on the Queen Elizabeth II on my way to Europe to be Best Man in a wedding in Germany, and I took the Concorde back. Three months later it was out of service, and the QE II's reign on the Atlantic was finished. These 2 ships are generally on the top 10 lists of North Atlantic ocean liners. Naturally, I decided to stay on the Queen Mary. 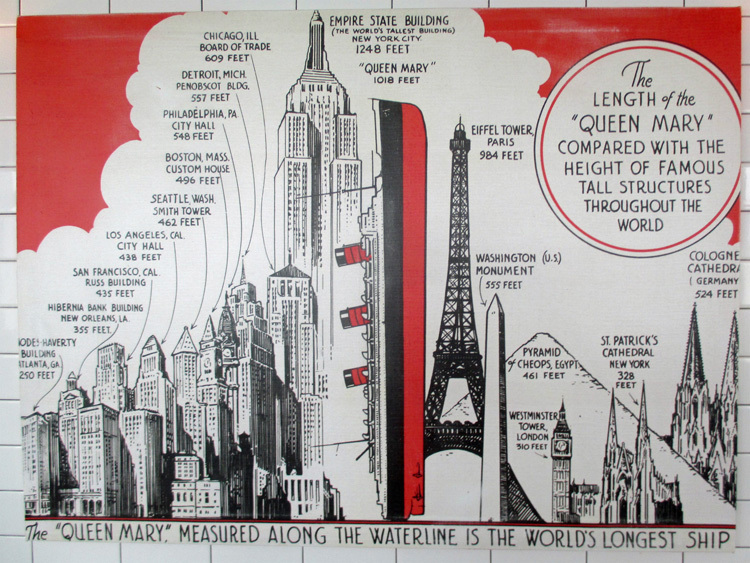 The Queen Mary has a storied history, converted from luxury liner to troop transport ship and back to luxury liner. It holds the record for the most troops transported in WWII. When Mike Sholer presented the high tech globe to me, he pointed out the instructions. The first issue was determining where to put it. At home it took me less than a minute to find a place to put the Globe. I put it in my living room about 2 meters from my favorite chair. It is on top of a wooden box under a picture window facing East. My father made this box when he was a teenager. The ambient sun light powers the globe to spin at about 20 seconds per rotation allowing text to be read. The Globe attracts attention without demanding it. What a perfect award for completing the TCC list! When you pick this Globe up, you can feel that it wants to orient itself and rotate. Then you notice that the outer globe does not rotate; it's the inner globe that rotates. When you watch the Globe silently rotating, it looks like magic. This Globe was made by MOVA. This home page has a one minute video showing moving globes. This is a two minute video with one quarter of a MOVA globe cut away to explain how it works. This is good background before you watch the longer video. This is a twenty-three minute enjoyable video by Bill French, the inventor of MOVA, explaining its invention and operation. It is patented. It took him 15 years to perfect this globe and its magical operation. If you enjoyed this video, you may want to read Bill's interview: Why I Became an Inventor. Thanks to the TCC Board for presenting me with a perfect award to celebrate my completion of the TCC list. Copyright © 2016 Donald M. Parrish, Jr. All rights reserved.